The holiest day in the year is Yom Kippur (Day of Atonement). It is known as "the Sabbath of Sabbaths". This is the day when we ask the Lord to forgive us for our sins of the year gone by. WHAT DOES THE LORD WANT FROM US FOR THE FORGIVENESS OF SINS ACCORDING TO THE BIBLE? So a sacrifice is needed for our transgressions; it was instituted to cover our sin. WHAT KINDS OF ANIMALS ARE TO BE SACRIFICED? Either lambs, rams, turtledoves, pigeons, goats or cattle. In more recent times the only form of animal sacrifice has been a chicken, even though the Scripture never speaks of chickens for a sacrifice. THEN WHY DON'T WE DO THIS TODAY? in the Scripture does it speak of such things? WHO IS THIS THE LORD OUR G-D SPEAKS OF? "Ye worship ye know not what: we know what we worship: for salvation is of the Jews. But the hour cometh, and now is, when the true worshippers shall worship the Father in spirit and in truth: for the Father seeketh such to worship him. G-d is a Spirit and they that worship him must worship him in spirit and in truth. is called Messiah: when he is come he will tell us all things. Yeshua saith unto her, I that speak unto thee am he. there is no need for the sacrificial system today. WHAT MUST I DO TO HAVE THIS SACRIFICE APPLIED TO MY HEART, SO THAT ALL MY SINS WILL BE WASHED IN MESSIAH'S BLOOD FOREVER? I"Therefore I will judge you. O house of Israel, every on according to his ways, saith the Lord G-D. Repent, and turn yourselves from all your transgressions; so iniquity shall not be you ruin. Cast away from you all your transgressions, whereby ye have transgressed; and make you a new heart and a new spirit: for why will ye die, O house of Israel? For I have no pleasure in the death of him that dieth, saith the Lord G-D: wherefore turn yourselves and live ye." "That is thou shalt confess with thy mouth the Lord Yeshua, and shall believe in thine heart that God has raised him from the dead, thou shall be saved. For with the heart man believes unto righteousness and with the mouth confession is made unto salvation. For the scripture says, Whosoever believeth on him shall not be ashamed. 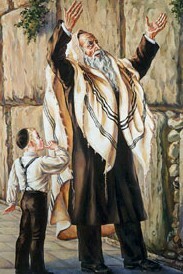 For there is not difference between Jew and the Greek: for the same Lord over all is rich unto all that call upon him. For whosoever shall call upon the name of the Lord shall be saved"
"For if, when we were enemies, we were reconciled to G-d by the death of his Son, much more being reconciled, we shall be saved by his life. And not only so, but we also joy in God through our Lord Yeshua by who we have now received the atonement." will forgive your sins once and for all. He is the Messiah, the anointed of God.